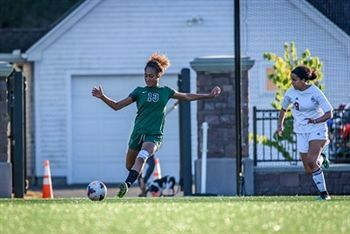 This weeks athlete of the week is Gabby Owens '19 from the varsity soccer team. Owens '19 is the type of player that practices as she plays, fully committed with intensity and a desire to win. On the field, she throws herself in front of anything and is fearless in the air at both ends of the field. As well as contributing to 16 shutouts in 19 games she has also contributed 5 goals, 3 of which were game-winning goals, which is a fantastic return from a central defender. Great leaders don't set up to be a leader, they set out to make a difference. Owens makes that difference! Congratulations on athlete of the week, Gabby.